William Dean Howells is often called the “father of American Realism” which basically means that he tried to avoid sentimentalism which had prevailed and wrote stories about society as it was at the time – 1860s-1910s. 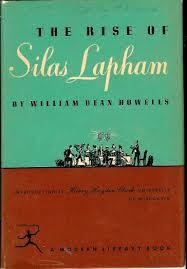 The Rise of Silas Latham was first published in 1885 – the height of the Gilded Age but there was also an economic “depression” in the years 1882-1885. I believe these are suggested in the narrative – in both business and social attitudes. Setting – business is booming, people are busily involved in “conspicuous consumption.” Boston had a very stratified social society at the time made up of aristocrats from Europe and millionaires from the US many long, long term residents – old money. This was along with a poor immigrant class but they aren’t really shown in the novel except for some hired help. Latham is a very successful and self-made entrepreneur/businessman who developed some kind of mineral paint which has become very popular. He is a braggart of the first degree but may have slighted a prior partner. They’re building a house in a more fashionable part of town. Persis, Latham’s wife, is concerned with the family’s place in society especially as concerns their uneducated but marriageable daughters, Penelope, the smart and funny elder girl and Irene, the pretty one. Mrs. Latham is concerned with propriety but stands by her man no matter what – even though she’s worried about his honor. One day a young man named Tom Corey shows up and expresses interest in Silas’ business. Corey is well educated and from the upper end of Boston society, but he’s a hard worker and a nice guy, liked by virtually all. His father, Bromfield Corey, is a rich dilettante but the couple realizes the money won’t last forever Corey wants to get into some sort of business enterprise – his father supports him, his mother is worried. The family becomes certain that Corey wants to marry Irene. They have very mixed feelings about people who don’t earn their own money and about how to approach or behave with people in the upper classes – dazzled and scornful at the same time. Tom Corey seems to be different. There is the broad brush of social satire or comedy of manners what with the Coreys and the Laphams concerned with status and embarrassing yourself and the prospects of marriage. Only Bromwell Corey seems unconcerned – maybe Tom, too. But when push comes to shove which is more important – money or a clear conscience?